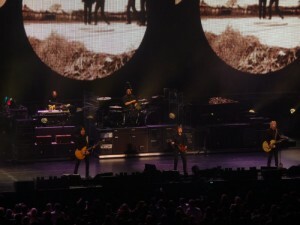 Paul McCartney and his current touring live band made a tour stop at the MGM Grand Arena in Las Vegas , Nevada on June 10, 2011 as part of his Up And Coming tour. The crowd consisted of every age demographic from children to great-grandparents. McCartney’s appeal is universal as his music spans 4 decades with hits all along the way. This stop’s timing made for a lot of interesting possibilities on this night as The Beatles Love show in Las Vegas is celebrating its 5th anniversary of performances. McCartney recently released re-mastered versions of his McCartney and McCartney II albums. Right before the show started there was a buzz in the crowd near the stage and everyone near the front stood and started taking pictures and cheering. Yoko Ono, Sean Lennon, Olivia Harrison, George Martin and Giles Martin had arrived and taken their seats to enjoy this stop on Paul McCartney’s tour. It added a nice level of excitement to know that John Lennon’s Son and Widow were in the audience along with the other members of The Beatles family. They were all in town to attend the Anniversary of The Beatles – Love show. The only member of the living Beatles family that was missing was Ringo. The show was scheduled to start a 7:30 PM and Paul and his band took the stage promptly at 8:00. It was a fashionably late start to give the arena time to fill to capacity. Paul walked onstage wearing his Hofner bass guitar and a cool looking jacket. He started off the show with a rocking rendition of The Beatles song Magical Mystery Tour. The band then quickly launched into the Wings hit Junior’s Farm followed by All My Loving and Jet. It was a great high energy way to kick off the show. The stage was flanked by two large projection screens with a wide projection screen that stretched the width of the stage behind the stage as well. The screen behind the band flashed images, graphics and video clips that went along with the songs. The graphics to Jet were particularly nice with jet airplanes spelling out the word “Jet” in contrails as the song played. McCartney paused at this point to thank the audience for coming and to give a shout out to Las Vegas jokingly calling it “Lost Wages”. He said he was going to take a second to drink it all in and crossed his arms on his bass and let the cheers and adulation of the crowd flow over him. He then launched into Got To Get You Into My Life followed by Sing The Changes which is an excellent track from The Fireman project. The crowd’s energy was really picking up and Paul McCartney paused to take off his jacket and Hofner bass. He commented “Well, that’s the major wardrobe change for the evening barring a malfunction.” Paul, now dressed in a blue button up shirt with white collar, suspenders and black trousers strapped on a Gibson Les Paul and played the rocking Let Me Roll It. I thought that was an interesting choice as John Lennon hated that song and Yoko was in the audience but it still rocked hard and the band played it well. At the end of Let Me Roll It McCartney and the band launched into the Jimi Hendrix riff from Foxy Lady and Paul did some fiery lead guitar work. Paul’s guitar skills are excellent and he really fired off some nice leads on this song. Paul then said “That was a tribute to the great Jimi Hendrix” and he told the story of meeting Hendrix in England. Paul told how he had gone to see Jimi Hendrix play two days after the release of the Sgt. Pepper’s album and Hendrix covered the song Sgt. Pepper’s Lonely Hearts Club Band at the show. McCartney told how Jimi had done some heavy whammy-bar tricks during the song and had knocked his Stratocaster wildly out of tune. Hendrix then called out to Eric Clapton who was in the audience as well and asked Eric to come up and tune his guitar. McCartney jokingly said that Clapton was trying to hide out in the audience! It was a great story for those of us that love the guitar. McCartney then moved to the grand piano and played The Long And Winding Road followed by the Wings song Nineteen Hundred and Eighty-Five which was really excellent. He then sang Let ‘Em In followed by the excellent Maybe I’m Amazed from the album McCartney. Paul sang Maybe I’m Amazed especially well singing beautifully in tune with some excellent vocal improvisations. The only thing revealing Paul’s age (68) was his voice being a little screechy on some of the falsetto notes but even then the man pours melody when he sings anything. I noticed that the light show pretty much stopped during this song and at the end of it McCartney announced that the song wasn’t scheduled to be played and he sprung it on the road crew. He said it was funny to see the surprise on their faces when the band launched into Maybe I’m Amazed. It was definitely a high point in the show. Paul then strapped on an acoustic guitar and played I’m Looking Through You followed by a beautiful version of And I Love Her. He then talked about following the civil rights movement of the ‘60’s in the news while living in England and introduced the song Blackbird as a commentary on the civil rights movement. The lyrics of Blackbird are extremely relevant to the civil rights movement. Again, Paul’s guitar playing was perfection. Paul then talked about telling those that you care about that you love and care about them before it becomes too late. He said “you just never know when you’ll see them again” and he introduced the song If You Were Here Today which he said he wrote about his good friend John Lennon. He shouted “Let’s hear it for John!” and the crowd stood and cheered for the great John Lennon. McCartney said the song was written from the point of view of sitting and having a conversation with John. There were some tears in the audience at this point. If you’ve ever wondered if Yoko had heard this beautiful song written for John Lennon you can rest assured she has heard it now. 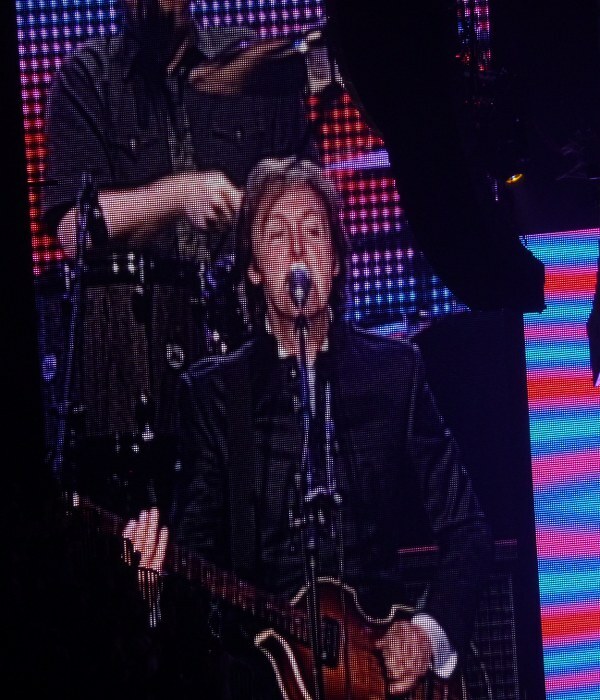 Paul then strapped on a mandolin and played his recent hit Dance Tonight whilst drummer Abe Laboriel Jr. did some sweet dance moves behind Macca including a bit of the Macarena. 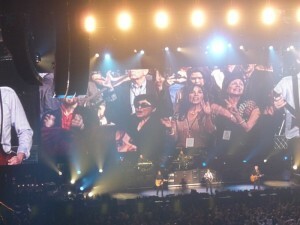 McCartney then played Mrs. Vandebilt with the crowd singing the “Hey-Ho’s” at the top of their lungs. Paul then did a very excellent rendition of Eleanor Rigby with Paul Wickens playing all the string parts on the keyboard while Laboriel and guitarist Rusty Anderson sang backing vocals. The lighting was really cool during Eleanor Rigby with Anderson and Laboriel standing in shadows during the verses and stepping into the light to sing the chorus. Paul was handed a Ukulele’ and proceeded to talk about the late great George Harrison. The crowd stood and roared their approval and voiced their love for the great George Harrison. Paul told how George was a great Ukulele’ player and had given Paul the Gibson Ukulele’ he was currently playing. He told how he visited George one evening and told him “I learned how to play one of your songs on the Ukulele’”. Paul then proceeded to play the Harrison classic song Something on the Ukulele’ with the band joining in for a lush and spectacular finish to the song. While the band played some excellent images of George and Paul together were put on the screen behind the stage bringing back memories of George’s vibrancy and youth. McCartney returned to his Hofner bass and the band played Band On The Run. Then McCartney asked the crowd to sing along with Ob-La-Di, Ob-La-Da commenting about how the crowd the other night stopped singing when the band stopped playing. The crowd sang along at the top of their lungs and as the camera panned the crowd and images were displayed onscreen you could see the joy in the audience. The crowd really was enjoying this night! One of the cutest moments was when the camera zoomed in on a Father holding his young child who was playing with a Paul McCartney doll. When the young man saw himself onscreen his face lit up with joy. The band immediately launched into Back In The USSR and nailed it. Macca then strapped on a sunburst Les Paul and played I’ve Got A Feeling with a sweet improvisational jam at the end with McCartney playing a wicked guitar solo. Paul then switched to an Epiphone Casino guitar which he said was the same guitar played on the Beatles album. Paul commented “You may have noticed that we like to switch guitars a lot. That’s because we like to show off! Just kidding.” The band played Paperback Writer to great applause. Yoko Ono, Sean Lennon and Olivia Harrison Singing "Give Peace A Chance"
Paul donned the Hofner bass and said it was a special night with special guests in the audience. He then introduced Yoko Ono, Sean Lennon, Olivia Harrison and the Martin’s in the audience and put them up on the big screen. The crowd roared their approval. Paul then played the beautiful Lennon/McCartney song A Day In The Life. Paul stopped singing it after the middle section and went into the Lennon song Give Peace A Chance with the crowd singing along at the top of their lungs. It’s a message that’s still relevant today and Yoko looked quite pleased as she stood and sang along. I’m sure she was happy that McCartney was up there spreading the message on this night. Paul then went back to the grand piano and played Let It Be. Then Paul pulled out all the stops and played the hard rocking Live And Let Die with some extremely awesome pyrotechnics and explosions. Live And Let Die was definitely a high point for the stage production. It was a bit awkward being placed so close to Give Peace A Chance and Let It Be. Paul ended the main set playing an upright piano painted with a psychedelic design and performed the song Hey Jude. The crowd cheered for an encore and McCartney and the band delivered Day Tripper and Get Back with Paul playing the Hofner bass. The band left the stage again and the crowd roared for more. For the 2nd encore McCartney came onstage with an acoustic guitar and played the Beatles classic Yesterday. He then strapped the Hofner bass back on and stepped it up big time by playing the song Helter Skelter with McCartney again nailing the vocal parts. To close the show Paul McCartney strapped on his Gibson Les Paul and informed the crowd it was time to go. He then launched into Sgt. Pepper’s Lonely Hearts Club Band (Reprise) followed by The End from the album Abby Road. The End featured some flaming guitar duels between McCartney and guitarists Rusty Anderson and Brian Ray. It was a fantastic one-two punch to close the show. 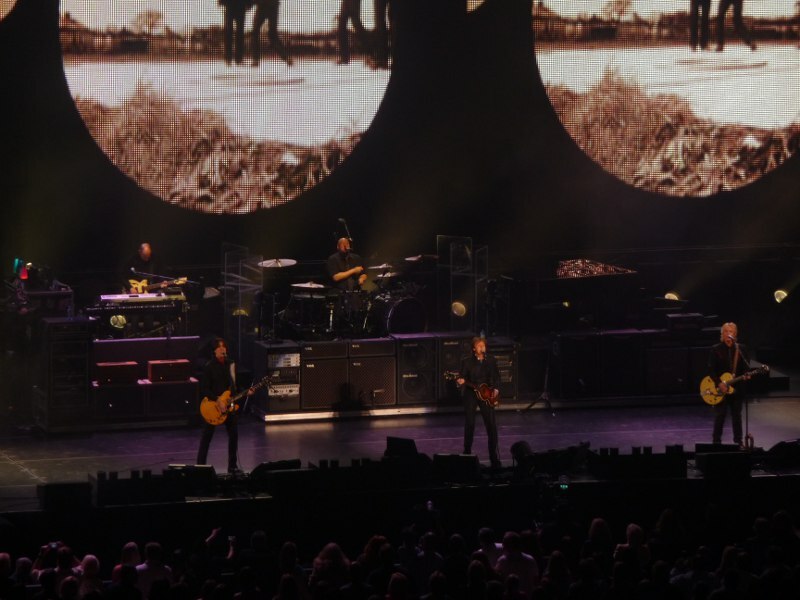 McCartney and his band were in fine form this night in Las Vegas. It was really a fantastic show although I’m surprised Paul didn’t play the song Coming Up from McCartney II with it being re-released and the tour being named after that song. Still, I feel very luck to have seen this show and the great Paul McCartney performing live. You never know when these guys are going to be gone so if you get a chance to catch Paul McCartney performing live, don’t miss it! Thanks for a well done play-by-play…Although I was there (at the Garden Arena, MGM, Las Vegas), I did not record each song. Your review was a great way to relive a once-in-a-lifetime concert experience. Saw him at Yankee Stadium last night. What was the new song he did, where images of Obama flashed in during the light show? I booed after that song, I booed hard and I booed long.